Combining a luxurious setting with first-rate facilities, the Melia Granada offers free Wi-Fi, a fitness centre and a coffee bar. This 4-star hotel is just a short stroll from Centro's vibrant nightlife. 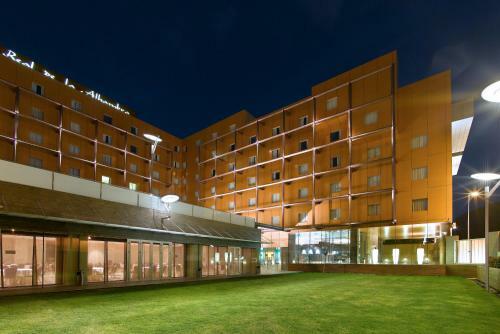 The Melia Granada offers a convenient 24-hour reception as well as a cafeteria, valet parking and meeting rooms. The hotel also offers highchairs, babysitting / child services and a currency exchange. Travel arrangements can be made at the hotel's tour desk. 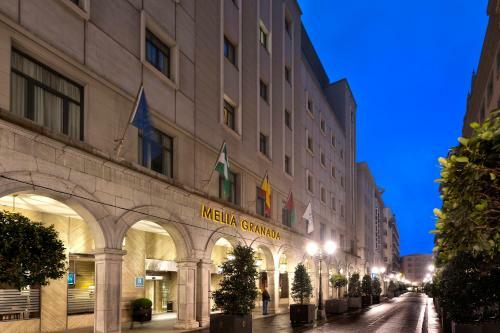 The air-conditioned rooms at the Melia Granada are comfortable and luxurious. A mini bar, a private bathroom and cable / satellite channels can be found in each room of the hotel. In-room movies, complimentary toiletries and a hair dryer are also available in every room. To ensure your day gets off to a good start, the hotel offers a buffet breakfast every day. The hotel's comfortable restaurant is open for lunch and dinner. For other lunch and dinner options, the hotel is surrounded by a wide selection of cafés and restaurants. Located close to a range of popular hot spots, the hotel is in close proximity to a number of bars, nightclubs and fashionable restaurants. Granada Cathedral, the Madrasah of Granada and Royal Chapel of Granada are within a quick 10 minute walk of the hotel. 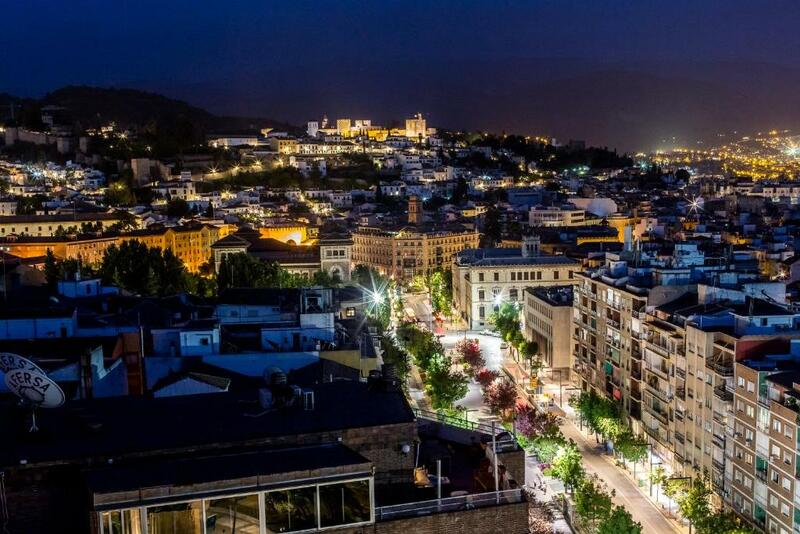 This hotel is 1258 metres from the Alhambra entrance, 458 metres from Plaza Nueva (the absolute centre of Granada), 1706 metres from the train station and 3265 metres from the bus station. This modern hotel is conveniently situated in the centre of Granada and offers its guests an outdoor pool, outdoor tennis courts and a jacuzzi. Some of the popular facilities at this large 4-star hotel include a fitness centre and a spa & wellness centre. The hotel has 368 rooms and has been recently refurbished. 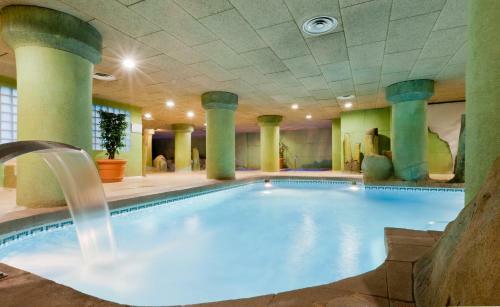 The hotel also offers massage services, meeting rooms and a convention center. The hotel's reception is conveniently open 24/7 for all your needs. Rooms at the Gran Hotel Luna de Granada are comfortable and rustic, and feature a mini bar. A hair dryer, a TV and a telephone can be found in each room of the hotel. To ensure your day gets off to a good start, the hotel serves a buffet breakfast each morning. For other meals, there are many restaurants and cafés located in the surrounding area. Located close to a range of popular hot spots, the hotel is in close proximity to lots of bars, nightclubs and quality places to eat. Generalife is around a 20-minute drive from the hotel. This hotel is 2547 metres from the Alhambra entrance, 1462 metres from Plaza Nueva (the absolute centre of Granada), 865 metres from the train station and 2508 metres from the bus station. Featuring a spa & wellness centre and an outdoor pool, the Hotel Macia Real de la Alhambra also provides a steam bath and a fitness centre. Some of the popular features provided at this modern 4-star hotel include ski passes and ski equipment hire. The Hotel Macia Real de la Alhambra offers multiple services including 24 hour room service, a sun deck and family/oversized rooms. Wireless internet is accessible in the hotel, meaning you'll have no problems remaining connected while on the road. Leisure options at the hotel include a beauty salon and a hair salon. The air-conditioned rooms at the Hotel Macia Real de la Alhambra are modern and comfortable. A mini bar, cable / satellite channels and a private bathroom can be found in each room of the hotel. A hair dryer, a desk with an electrical outlet and a sitting area are also provided in every room. To ensure your day gets off to a great start, the hotel offers a continental or a buffet breakfast each morning. Andalusian cuisine is served at the hotel's restaurant. For guests spending the day out, the hotel offers packed lunches should you require them. Federico Garcia Lorca Airport is less than a 30-minute drive from the Hotel Macia Real de la Alhambra. Guests looking to relax can make the most of the hotel's snooker room. 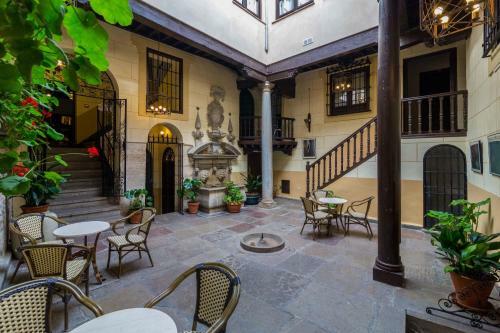 This hotel is 1719 metres from the Alhambra entrance, 2730 metres from Plaza Nueva (the absolute centre of Granada), 4295 metres from the train station and 5591 metres from the bus station. 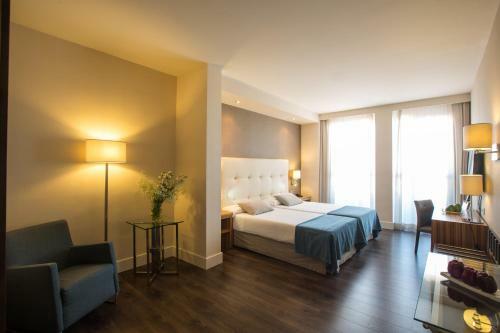 Located only a 10 minute stroll from Granada Train Station, the Vincci Granada Hotel features an executive floor, air conditioning and valet parking. This 4-star hotel is just a short stroll from Beiro's lively nightlife. The hotel offers honeymoon suites. Meeting rooms, a 24 hour reception and babysitting / child services are only some of the features that this romantic hotel has for guests. The hotel also offers guests the convenience of a Wi-Fi connection. 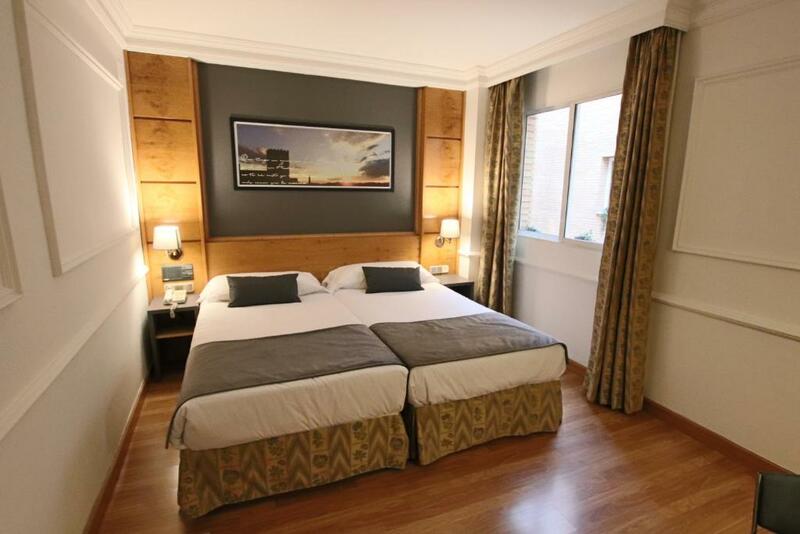 The Vincci Granada Hotel offers comfortable and spacious rooms equipped with cable / satellite channels, complimentary toiletries and a mini bar. A private bathroom, in-room movies and a hair dryer can be found in each room of the hotel. A shower, a desk with an electrical outlet and heating are also available in each room. To ensure your day gets off to a great start, the hotel offers a buffet breakfast each morning. For other meals, there are many restaurants and cafés located close by. Located close to a number of hot spots, the hotel is near lots of bars, nightclubs and quality places to eat. Generalife is less than a 20-minute car ride from the hotel. This hotel is 2272 metres from the Alhambra entrance, 1254 metres from Plaza Nueva (the absolute centre of Granada), 435 metres from the train station and 1775 metres from the bus station. 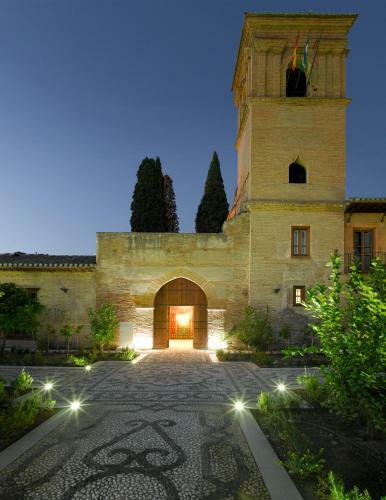 The parador of Granada is actually situated in the grounds of the Alhambra. It is not right in the centre of Granada but you can easilly commute into the centre on the C4 minibus or a taxi would cost around 7 euros. The parador has a pleasant restaurant. There is a special gluten-free set menu for €33. Beverages not included. Vehicle access to the Alhambra complex is only open to guests who have a room reserved at the Parador. On arrival it is necessary to provide proof of reservation at the entrance gate, then you should follow the signs and continue to the end of Real de la Alhambra, where the parking area and entrance garden are located. The parador is fairly expensive but the quality is very high. 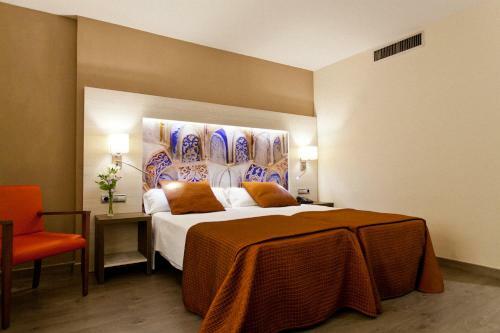 This hotel is 380 metres from the Alhambra entrance, 736 metres from Plaza Nueva (the absolute centre of Granada), 2255 metres from the train station and 3518 metres from the bus station. 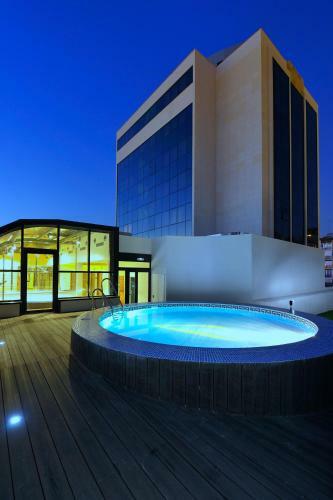 Situated within a 10 minute stroll of the Plaza Bib-Rambla, Granada Cathedral and the Palacio de Exposiciones y Congresos, this 4-star modern hotel offers a jacuzzi and a rooftop pool. The hotel has 222 rooms and has been recently refurbished. The hotel also offers babysitting / child services, meeting rooms and a 24 hour reception. A car rental desk, a currency exchange and room service are also available at the hotel. The Hotel Carmen Granada offers large and modern rooms equipped with a telephone, a mini bar and a hair dryer. Rooms also offer internet access. To make sure your day gets off to a good start, the hotel provides a buffet breakfast each day. The hotel's comfortable restaurant serves lunch and dinner. For more lunch and dinner choices, the hotel is surrounded by a wide variety of venues to eat at. This Centro hotel is set in an area popular with tourists and is not far from Royal Chapel of Granada and the Madrasah of Granada. Generalife is less than a 20-minute car ride from the hotel. This hotel is 1312 metres from the Alhambra entrance, 714 metres from Plaza Nueva (the absolute centre of Granada), 1920 metres from the train station and 3512 metres from the bus station.